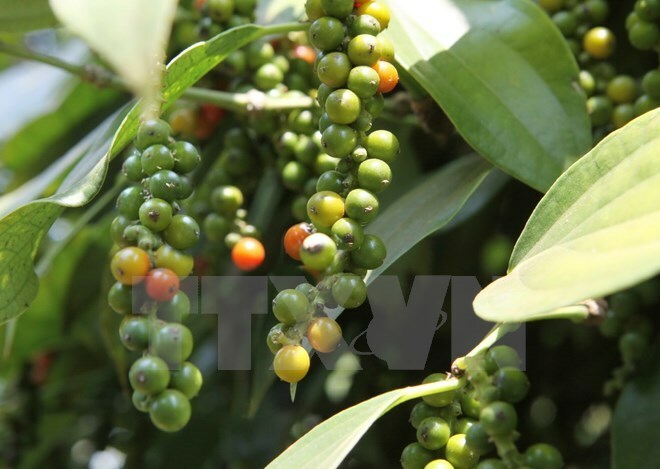 Hanoi (VNA) - The Ministry of Industry and Trade (MoIT) has added pepper to the list of commodities traded on the Vietnam Commodity Exchange (VNX), according to the ministry’s Decision 1071/QD-BCT issued last week. The pepper products to be traded on the VNX include black and white pepper under code H.S 090411, and black and white ground pepper under code H.S 090412. Trading on the exchange will allow Vietnam’s pepper industry to enhance its global trading activities, according to the Vietnam Pepper Association (VPA). Vietnamese pepper accounts for 60 percent of total pepper volume trading on the global market, meaning the price of Vietnamese pepper has always exerted a significant influence on global pepper prices. Pepper traded on the VNX will also connect to worldwide commodity exchanges, allowing for the transparency of information being exchanged, reducing risk during trading and offering insured pricing, according to the VPA. Since 2014, the Vietnamese Government has planned to build an exchange for pepper, with the cooperation and support of the Indian Government. The two countries have discussed the building of cooperation mechanisms and technical support, so that the two sides, which are the two largest pepper producers in the world, can coordinate in the regulation of the global pepper market. In the first two months of this year, Vietnam’s export volume of pepper reached about 16,000 tonnes, earning 112 million USD. These figures represented a year-on-year reduction of nearly 20 percent in volume and 36 percent in value. The reduction was due to the global pepper price, which dropped by 20 percent against the same period last year. Vietnam’s largest pepper export markets in the first two months included the US, India, Germany and the UK, accounting for over 41 percent of total pepper exports. In 2016, Vietnam’s pepper exports reached 177,893 tonnes, earning 1.43 billion USD, an increase of 35.3 percent in volume and 13.5 percent in value year-on-year. According to the Ministry of Industry and Trade’s target in 2017, pepper will be in the group of 13 exports with a value of over 1.5 billion USD. The local pepper industry’s export turnover this year is expected to reach 1.6 billion USD, up 13 percent over 2016. With the latest decision, pepper has become the third commodity traded on the VNX, joining rubber and coffee. VNX has been licensed by the Ministry of Industry and Trade to operate with total charter capital of 150 billion VND.